From sunny and warm Florida, wishing you and your family a wonderful holiday season! And best wishes for a peaceful, happy New Year and a wonderful 2012! 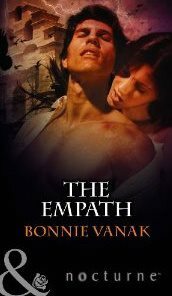 The Empath has been released by Mills and Boon in the UK! Enemy Lover will be released next month by Mills & Boon. In other news, I finally have a new website. You can check it out here. I wanted a darker look to reflect the dark paranormals I'm writing. 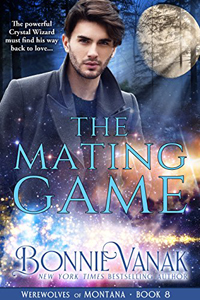 My wonderful designer organized the books page to make it easier to access all the books, and there's a new releases page and a page for international editions. This will make it much more user friendly. If you want to know the latest books, you need only click on the new releases page. In other news, I'm busy trying to finish the Nocturne due the end of this month, getting ready for Christmas and sorting through a lot of projects at the day job. The book is close. Almost there. Almost. Speaking of which, I'd better get back to work because if I make the rum balls first and then write... not a good idea! She was a very special person, a best friend as well as my mother. Mom enjoyed reading romance novels. It's because of her love of the genre that I started reading them as well. We took many wonderful vacations together. Sometimes we visited states like Montana, where she would sit on a bench reading a book while I went hiking in Glacier National Park. This photo is from our last vacation together, the year before DH and I got married, and the year before she died from cancer. It was a dream trip for both of us. I'm very thankful we were able to take this vacation, and I feel blessed with all the memories I'll always cherish of our times together. This weekend it will be 16 years since we lost her. Some days, it feels like yesterday. Mom adored Christmas. It was her favorite holiday. She'd spend weeks getting ready, from making cookie press cookies, to decorating the house and shopping. She created a wonderful tradition. We had to give away some of our toys to poor children before Christmas, because before we could get new toys for Christmas, we had to share what we had with children who had nothing. When she was dying from cancer, my brother bought her a little Christmas tree with lights, so she could look at it from her bed. I still have the tree, and when I put it out, I remember my mother and the joy she brought to us all during the holiday season. We buried her 3 days before Christmas, three months after Dh and I married. She hid her illness from the family, along with her pain. It was only after we returned from our honeymoon and she collapsed that we discovered she didn't have long to live. I think she wanted to make sure I was settled, and happy, before passing on. That was the type of woman she was - always putting others before herself. Miss you mom, always. Thank you for everything you did for all of us. Busy with the holidays, trying to finish the new Nocturne due the end of this month and working at the day job. I am also working with a terrific designer and hope to launch my NEW website by January 1. Happy holidays, and may the stress of the season stay far from you! 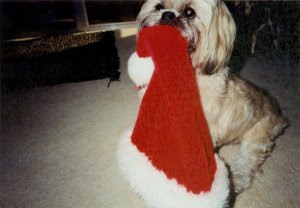 Tia, our beloved Shih Tzu, died Dec. 7, 2006. She had liver cancer. She was a wonderful dog and a friend as well. Miss you, sweetie. I hope all dogs do go to heaven, because you sure deserve to be there. Today is the release day for HUNTED BY THE JAGUAR, the third novella in The Ancients! Click here to order HUNTED BY THE JAGUAR on Kindle. 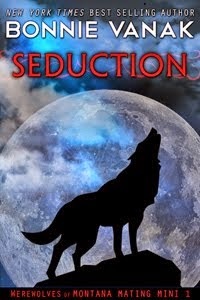 To celebrate, I'm giving away a copy of MATED TO THE WOLF, my second novella in The Ancients series. Just leave a comment on this blog to enter, or email me at bonnievanak@aol.com. Contest ends Dec. 30. Good luck and happy holidays!